The Ontario Volleyball Association (OVA) is an athlete-centred association where dedicated volunteers and professional staff provide leadership in the growth and development of volleyball for all Ontarians. 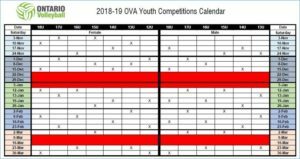 Clubs are required to adhere to OVA's new "Tryout Window" policy. This policy basically states that no club can offer a position to a player until Sunday, September 30 at 10:00pm. Additional OVA changes can be found at What's New 2018. Parents must complete Respect in Sport training as per OVA's policy. Your coach and/or team manager will be dealing with a new hotel booking process for Provincials that is related to OVA's "Stay to Play" policy. 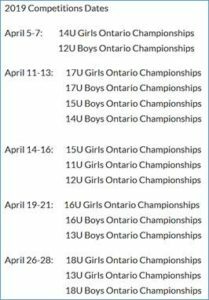 Teams must first register in Ontario Championships to be eligible to book their accommodations for that event. All travelling teams (125kms+/one way) are required to book hotel rooms through Hudson Travel Group to be eligible to play in the tournament.